I grew up all over India as my father was in the Army. It was an idyllic childhood - full of adventure and secure. Almost every cantonment we stayed at, had a small library so books were a big part of my growing up. One read anything and everything one could lay hands on. I opened my first book lending library in grade III. I graduated with a degree in commerce and then studied finance and marketing. Survived two days in a Bank and decided to work for myself - I set up a company that did a bunch of interesting projects with corporates including setting up a CSR arm for one. Reading caterpillar, a Library for children was started in 2009. And last year, a group of us, brought out a magazine for children ages 8 year to 14 years, called Thinkling. We have come out with 3 issues and the response has been excellent, both from the children as well as the parent and teacher community. What inspired you to start Reading Caterpillar? 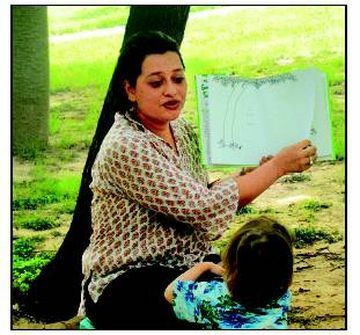 After my children were born, I noticed the lack of children’s reading spaces in Delhi. I met other parents and teachers who talked about the need of such a space. We started a small community of parents and would meet with our children and share the joy of reading. Reading Caterpillar was born out of a need for a library for young children. I realised that it had to be an interactive space that would bring children and people who work in this sphere closer. Authors, illustrators, parents, crafts persons are all an integral part of Reading Caterpillar. How do you plan to scale up Reading Caterpillar? Currently the library is for children up to 11 year old, we add an age group every year. The focus is on growing horizontally creating more programming as the age group changes, involving the parent community in running the community projects and instead of creating many offshoots, we are working on a model where we can carry the library to different places. Till now we have had children from a few NGO’s visit us, this year we have decided to help set up libraries at their centres. In the coming years, I do see the library involving children especially the older ones in spreading the joy of reading. A message to SHEROES out there. Introspect, gift yourself a passion, and take pride in whatever work you do.